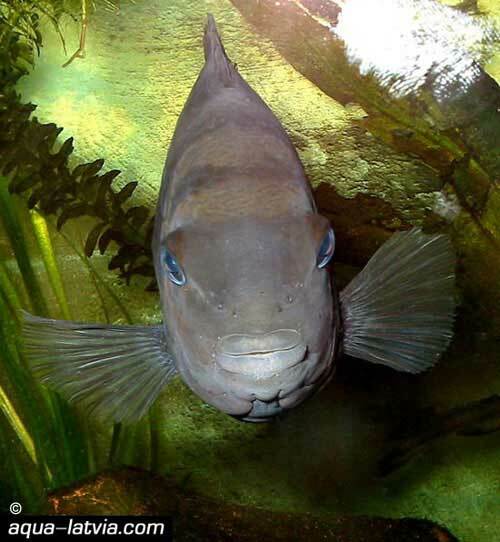 The Convict Cichlid originates from Central America. It is also known as the Zebra Cichlid, but using this terminology creates confusion with the African Cichlids called Pseudotropheus Zebra. The Convict Cichlid is known by the scientific name Archocentrus nigrofasciatus and more recently by the name Cryptoheros nigrofasciatus. 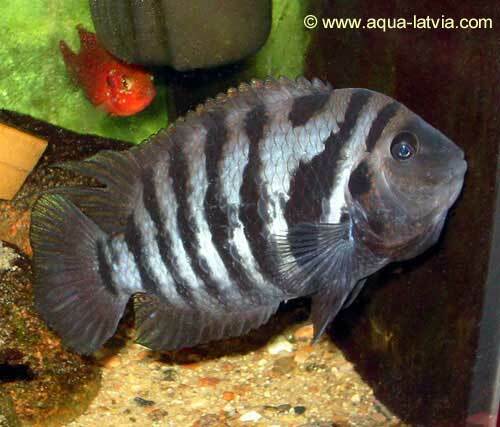 Convict Cichlids have blue-gray bodies with 8 or 9 dark bands in a pattern named after the stripes on prison clothing. They have a dark spot near their gills too. There are Black (which has a gray background), Pink (which has dark pink areas on a light pink background) and White variations (which have no stripes). Convict Cichlids are among the most aggressive cichlids, both toward fish and toward anything else in the tank. They should be kept either alone or in groups of at least four. They will rearrange any decorations and plants in the tank. Water quality is not an issue for them. They will eat almost anything, including cichlid pellets, freeze-dried blood worms, flake foods, brine shrimp and small live fish. Convict Cichlids are compatible with Green Terrors, Jack Dempseys, Red Devils, Texas Cichlids. Danios and Tin Foil Barbs are suggested as dither fish for them to chase. This may reduce aggression toward other cichlids, but it's a terrible life for dither fish. Females have yellow or pink on their bellies, while males are larger and can have a small bump on the forehead. Convicts are one of the easiest fish to breed and they are excellent parents. The pair becomes especially aggressive while breeding, so they should be moved to a separate tank. To initiate spawning, most sources agree that having Convicts and water are all that’s necessary - Convicts breed like rabbits. Although it is recommended to isolate Convicts for breeding, it is not necessary to isolate their young from their parents or from other fish. Convict parents can successfully guard hundreds of fry in a tank occupied by other cichlids. The fry should be fed finely ground flake food or powder.